In this page we will talk about the Grid storage facilities, the tools to interact with it and the method to handle data that is stored on tape. Each cluster on the Grid is equipped with a Storage Element or SE where data is stored. The Grid storage is useful for applications that handle large amount of data that can not be sent with the job Sandbox or stored in a pilot job database. Be member of a VO for which we have allocated storage space. It is possible to access the dCache Grid storage without certificate, by using webdav clients with username/password authentication. However, authentication with username/password is less secure, and Webdav is not as fast as GridFTP. The storage element located at SURFsara is accessible from any Grid cluster or UI. It uses the dCache system for storing and retrieving huge amounts of data, distributed among a large number of server nodes. It consists of magnetic tape storage and hard disk storage and both are addressed by a common file system. See dCache specifications for details about our dCache instance. The last one, ipv4.grid.sara.nl, is a single VM that supports only IPv4 and no IPv6. It can be used for small scale access through GridFTP, Webdav, Xroot or GSIdCap where IPv6 causes problems. Don’t use it for batch processing. The InputSandbox and OutputSandbox attributes in the JDL file are the basic way to move files to and from the User Interface (UI) and the Worker Node (WN). However, when you have large files (from about 100 MB and larger) then you should not use these sandboxes to move data around. Instead you should use the dCache and work with several Storage clients. In this section we will show the common commands to use the various storage clients. From the many Grid storage clients, we recommend you to use the : globus client or gfal client. These tools have a clean interface, and their speed is much better on our systems compared with their srm-* equivalents. The GridFTP protocol offers the best network performance. Examples of tape control: staging a file from tape to disk, or get its locality (tape or disk). (1, 2, 3) SRM and LCG commands use the SRM protocol for metadata level operations and switch to another protocol like GridFTP for file transfers. This may cause protocol overhead. For example, authentication needs to be done twice: once for each protocol. For small files, that may be inefficient. UberFTP currently has a dangerous bug that may destroy data. See https://ggus.eu/?mode=ticket_info&ticket_id=129103 for details. The dCache storage at SURFsara consists of magnetic tape storage and hard disk storage. If your quota allocation includes tape storage, then the data stored on magnetic tape has to be copied to a hard drive before it can be used. This action is called Staging files or ‘bringing a file online’. Staging is important. If your job reads a file that is on tape but not online, your job will wait until dCache brings the file online (or reaches a timeout). This may take minutes when it’s quiet, but it may take days when multiple users are staging large datasets. That would be a waste of CPU cycles. But that’s not all: the number of concurrent transfers is limited per pool, so it would also be a waste of transfers slots. There are some more file statuses. See the SRMv2 specifications for a full list. For the staging examples below, you need a valid proxy, see StartGridSession. Don’t use this method to stage multiple files. Use the stage.py example below instead, because it is much more efficient. The example below shows how to stage a list of files with known SURLs. Copy and untar the tarball staging scripts to your UI home directory. This script stages a number of files from tape. You can change the pin lifetime in the stage.py script by changing the srmv2_desiredpintime attribute in seconds. Your files may remain online as long as there is free space on the disk pools. When a pool group is full and free space is needed, dCache will purge the least recently used cached files. The tape replica will remain on tape. The disk pool where your files are staged has limited capacity and is only meant for data that a user wants to process on a Grid site. When you pin a file you set a pin lifetime . The file will not be purged until the pin lifetime has expired. Then the data may be purged from disk, as soon as the space is required for new stage requests. When the disk copy has been purged, it has to be staged again in order to be processed on a Worker Node. When a pool group is full with pinned files, staging is paused. Stage requests will just wait until pin lifetimes for other files expire. dCache will then use the released space to stage more files until the pool group is full again. When this takes too long, stage requests will time out. So pinning should be used moderately. This command will initiate unpinning of file zap.tar (even if you submitted multiple pin requests) and the file will remain cached but purgeable until new requests will claim the available space. It is an optional action, but helps a lot with the effective system usage. At the moment neither the srm-bring-online nor the python gfal scripts can effectively release a file if there are multiple pin requests. Please use srm-release-files. dCache checks the checksum of a file on many operations (for instance, during tape store & restore operations). If dCache finds, that the checksum of a file does not match the checksum it has in its database, dCache will refuse to continue and will present an error message instead. dCache is configured to use Adler32 checksums by default, for performance reasons. It is however possible to transfer files to dCache while verifying MD5 checksums. Globus Online works only with MD5 checksums, and previous versions of dCache did not support MD5 checksums, so one would have to disable checksum checking in Globus. Now, dCache does support MD5 checksums during transfers, even when the default checksum type is Adler32. So now Globus Online and dCache should be able to work together with checksums enabled. If a GridFTP client uploads data with MD5 verification enabled, dCache will calculate the MD5 checksum, return this to the client and store it in its database. dCache does not enable a user to add MD5 checksums of existing data. We may however, if your project needs it, change the default checksum from Adler32 to MD5 for your poolgroups. From the moment we do that, for new files, dCache will store MD5 checksums in its database, and this MD5 checksum will be used to verify file integrity during operations. Checksums for existing data will not be recalculated however: they will remain Adler32. Also through webdav clients you can retrieve a file’s checksum. The checksum value comes from the database so it performs well. 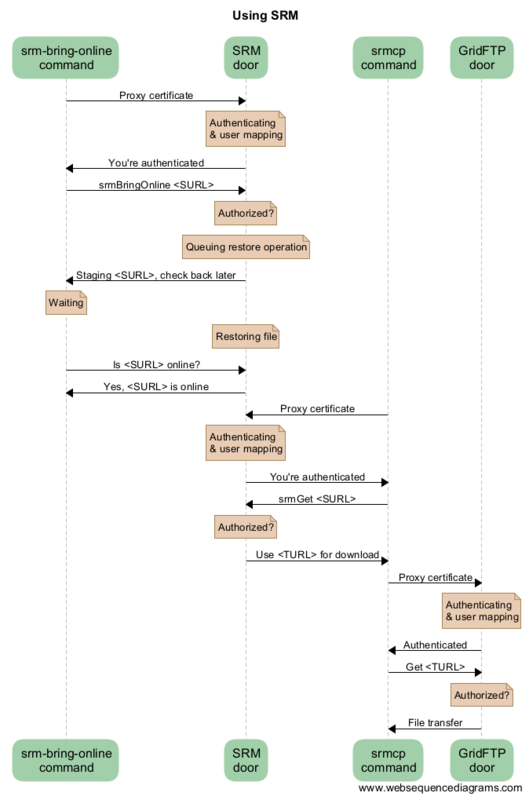 With most protocols, the authentication is done over a secured channel (usually encrypted with TLS). After authentication, the data is transferred in plain text. Since most users are from High Energy Physics, this is usually no problem. Life scientists however may need to store private data such as MRI scans or DNA scans. The European GDPR law requires careful handling of such personal data. We therefore suggest that you keep such data safe during transport. Below we give an overview which protocols in dCache encrypt data during transfer. Since WebDAV is currently the only way to encrypt data in transit, we continuously try to improve the security of our WebDAV doors. We regularly test our WebDAV doors with tools like the Qualys SSLtest, nmap, Greenbone/OpenVAS, and others, and follow their recommendations. The conclusion: if your data is personal, safely upload it to and download it from dCache, by using WebDAV over ports 2881 or 2884. See webdav clients for more information. Here is a sequence diagram that illustrates how the SRM commands interact with the Grid storage. As you can see from this diagram, there can be a lot of overhead per file. For this reason, Grid storage performs best with large files. We recommend to store files of several megabytes to gigabytes. Some users have files of more than 2 terabytes, but that may be impractical on other systems with limited space like worker nodes. The Data Ingest Service is a SURFsara service for researchers who want to store or analyze large amounts of data at SURFsara. The service is convenient for users who lack sufficient bandwidth or who have stored their data on a number of external hard disks.